The M3 Bradley Fighting Vehicle that led the charge from Kuwait into Baghdad in 2003 has once again served as the lead vehicle advancing on a vital objective. This time the objective was the campus of the National Museum of the United States Army (NMUSA) now under construction at Fort Belvoir, Va. The Bradley, assigned to the 3rd Infantry Division, 3rd Squadron, 7th Cavalry A Troop, during the Iraqi war, was the first of four macro artifacts to be pre-positioned early in the construction process on reinforced concrete slabs and extensive support structures in their permanent display locations. 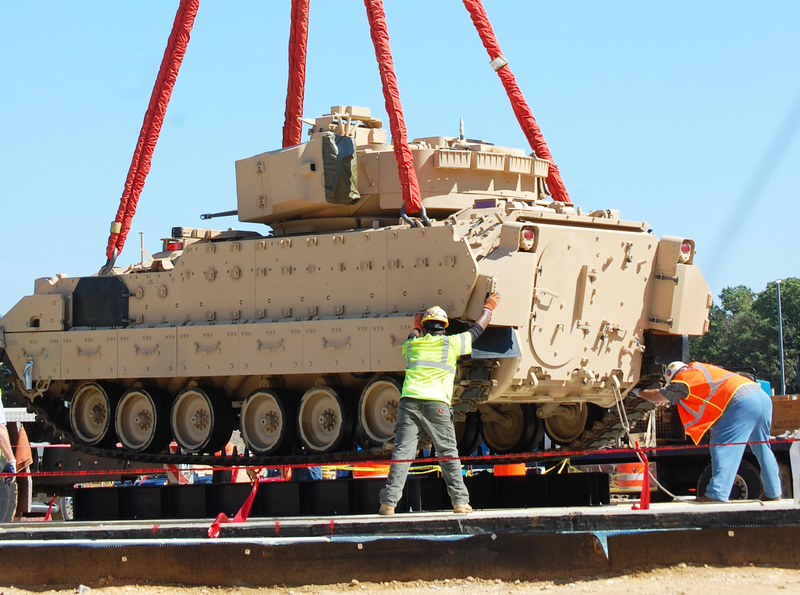 The M3 Bradley Fighting Vehicle is placed in its permanent location at the construction site of the National Museum of the United States Army. Once hoisted from flatbeds by crane into their positions, the macros were wrapped and sealed in protective containers until the museum’s construction is completed. The Bradley will be exhibited in the museum’s Continuing War Gallery. The three remaining macros that were pre-positioned – a World War II M4A3E2 Sherman “Jumbo” Tank, a World War II LCVP “Higgins Boat,” and a World War I Renault FT-17 Tank – will be featured in the Changing World, Global War, and Nation Overseas galleries, respectively. Allen Pinkney, NMUSA deputy director, pointed out that the 28-ton Bradley not only led the charge to Baghdad, but helped gain control of several key positions including Baghdad International Airport before advancing into the city. Also according to Pinkney, the Sherman Tank, known as “Cobra King,” led the 4th Armored Division column that broke through German lines ringing the Belgian town of Bastogne and a critical road junction in Allied hands. “The breakthrough opened the way for Allied forces to begin the counteroffensive that ended the Battle of the Bulge,” Pinkney added. The historical significance of the Higgins Boat and the Renault FT-17 Tank is equally impressive and destined to immerse visitors of all ages in the Army’s history and heritage when the museum opens its doors in 2019. “The pre-positioning of these four macros while construction is still occurring is impressive and marks another significant milestone toward completion of the museum project,” said Gen. Gordon R. Sullivan, USA, Ret., Army Historical Foundation chairman, who is heading the $200,000,000 capital campaign to construct the museum. Sullivan noted that there will be other, equally historically significant macro artifacts displayed in the museum, but only these four required pre-positioning before building the museum’s walls around them because of their size.